If you know craft beer in Vancouver then you have heard of Steamworks Brewpub located in Gastown. 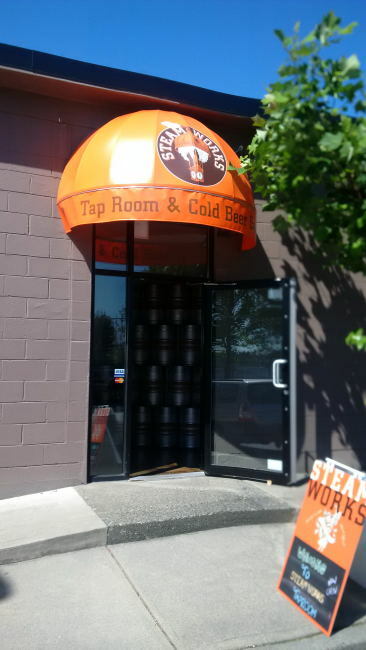 Very recently though Steamworks has opened up a Brewery and tasting room in Burnaby. This location will now act as the commercial brewery side of the operation. It makes all beer consumed in bottles and on tap outside of the brewpub and even some sold there. The brewpub will now act more like a pilot system to experiment with recipes. When you walk in the front doors of the tasting room you will be welcomed by a huge room with lots of seats and a large bar. Sample some beer and maybe have a snack! They even serve non alcoholic drinks for the odd person coming in that does not drink. They have a cooler with a bunch of beer that you can purchase or you can get growler fills. The staff is super friendly and very helpful and will walk you through the taproom if its your first time in a craft brewery. Their lounge license is in the works also so this could be your new place to stop in for a few pints after a long day at work! While at the brewery on opening day I happened to run into the Founder and owner of Steamworks Eli and after we chatted for a while he offered to give me and a friend a personal tour of the brewery. I was quite impressed with Eli’s knowledge of the brewery and the brewing process in general. Not all owners have knowledge of the beer side of the operation. We toured through the brewery, canning line and bottling line and it was all pretty impressive! This brewery sure has taken a step up from its humble brewpub roots. It has to be one of the largest operations in BC almost overnight. This brewery just like the Brewpub location uses steam in the brewing process as it imparts unique characteristics and come on it is in the name! Take a peak into the brewery below. So if you are in Burnaby be it for work or pleasure then you really should check out the taproom and brewery. The brewery is also fairly close to Gilmore Station on the Millennium Line skytrain with a 18 minute walk between train and taproom! I would like to thank Eli for the great tour of the brewery and I look forward to many glasses of beer in the taproom in the future! This entry was posted in Brewery and tagged bc, beer, brewery, Burnaby, canada, craft beer, steam, steam brewhouse, steamworks, steamworks brewery, tap room, tasting room.